To see some of the most stunning landforms on the earth, put Namibia in your travel plans and discover beauty within the stark, harsh and dramatic landscape of this little known African country. Namibia is known for many topographic firsts. It has the oldest desert on earth and some of the highest dunes at 380 m. The largest non-subglacial lake in the world, Dragon’s Breath Cave, is one of the best kept secrets of Namibia. Hiking enthusiasts must visit this country to hike the spectacular Fish River Canyon, the second largest canyon in the world. Namibia is named after the 80 million year old ‘Namib’ desert, where ‘Nama’ refers to the vastness of the region. You may have seen satellite images of the vast sand dunes and impact craters created by meteorites, but seeing them in person is a mind-blowing experience. The national anthem of Namibia rightly eulogizes the country as ‘the land of the brave.’ Its people bravely withstood external oppression as well as the rigors of life in a harsh desolated land. So it doesn’t come as a surprise that Namibia has made conservation the cornerstone of its development programs. More than 40% of the country is under conservation management, and the results are easily visible. Today, Namibia hosts the world’s largest population of free-roaming cheetahs, and desert-adapted elephants. What’s unique about the Namibian model of conservancy is the coexistence of local tribes with the natural habitat of the region that ensures mutual respect and protection. Communities are actively engaged in sustainable practices and environmental protection, even while employed within the tourism industry. This ensures low impact tourism while protecting wildlife and empowering communities. Namibia’s climate is largely dependent upon the surrounding geography. Heavy rains fall during November to April, and daytime temperatures exceed 40C during January and February. However, the coastal areas are cool. Generally, any time is a good time for a Namibia visit, although you may like to check out the destinations you plan to include in your itinerary or the activities planned. The topography of Namibia is varied, offering wonderful experiences in every region. To the north is Etosha National Park and the Kaokoveld coastal desert. Etosha is a large game park, home to 114 mammal species, 400 recorded bird species, and scores of reptiles. It is the most sought-after destination for travelers visiting Namibia. The Kaokoveld is “Africa’s last great wilderness” – a harsh, mountainous environment which supports the endangered Kaokoveld elephants and desert-adapted lions. While the towering granite landmarks of Damaraland and rock art sites are popular tourist attractions, the Epupa Falls are a must-see for its startling contrast to the arid surroundings. In the south is Sossusvlei and Fish River Canyon. Sossusvlei is a vast dune sea located in the heart of the largest conservation area of the Namib-Naukluft National Park. The dunes here are the highest in the world and colored red at the time of sunrise and sunset. Plenty of lodges offer safari tours and sand-based adventure activities. Experienced hikers like the challenge of the multi-day hike through the Fish River Canyon. An 85 km long trail takes you past dramatic rock formations and shaded rock pools. Hiking the canyon is advised only from May to mid-September, due to the intense heat at other times of the year. Along the Atlantic Coast in the north lies the eerie Skeleton Coast littered with shipwrecks and whale skeletons pushed on shore by the ocean waves. If you are visiting during mid-October or November-December, you can expect to see a massive seal colony at Cape Cross Seal Reserve. The impressive landscapes and barren wilderness of Namibia have inspired many Hollywood filmmakers to use the country for stunning backdrops. With Namibia on your travel itinerary, you cannot miss the wonderful opportunity to capture the spectacular vistas of endless seas of red-patterned sand dunes and beautiful terrain. So make sure to carry your camera with you. A Namibia visit is not for the faint of heart. Its beautiful contrasting landscapes offer a great opportunity for adventure activities. Hiking, plateau mountain climbing, 4X4 off-road trips and caving are some of the land-based activities. Looking for more? Go horseback riding across the vast desert, indulge in wild camping at Namibia’s many incredible sites, or stargaze at one of the top stargazing destinations in the world. 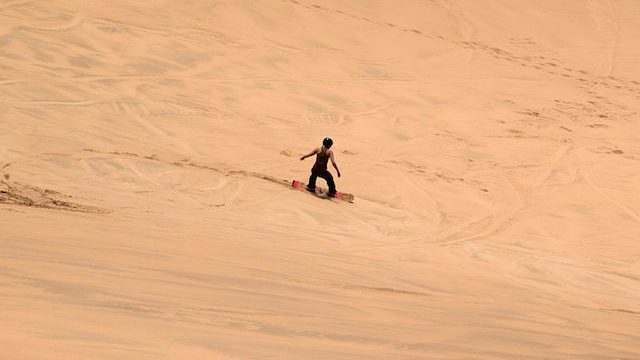 The endless stretches of vast and tall dunes offer the perfect backdrop for sandboarding. Zoom down the steep sand slopes on a traditional sandboard or zigzag your way up a tall sand dune. 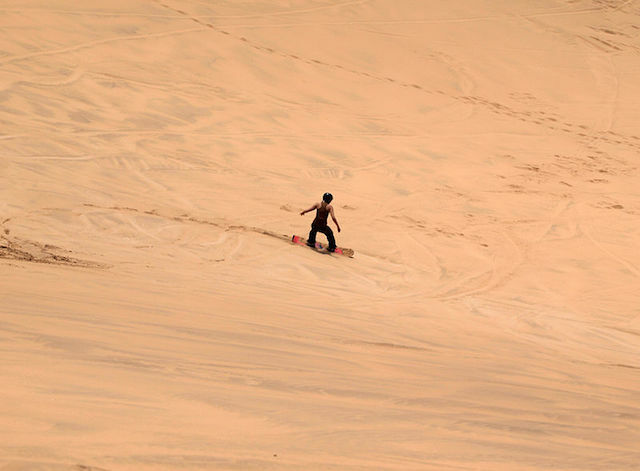 If sandboarding has always been on your bucket list, the dunes of Namibia are the best places to start. Although Namibia is predominantly arid, its western borders are lapped by the Atlantic Ocean. So you can expect plenty of water-based sports like canoeing, rafting and kayaking. The Orange, Kunene and Okavango rivers offer great rafting trips and guided canoeing safaris. Walvis Bay and Luderitz are popular wind and kite surfing sites, with the blustering winds encouraging freestyle surfing and extreme sports. Looking for a more laid-back adventure? The rich marine life has encouraged local tour operators to conduct dolphin cruises for getting up-close with Cape fur seals and dolphins. Catamaran tours offer a more immersive and luxurious experience, with opportunities to see humpback whales and leatherback turtles. Last but not least, there are of course, safaris. Namibia is known for its breathtaking landscapes and game filled parks. You can go for self-drives, fly-in tours, guided overland tours, camel safaris, horseback riding safaris, and walking safaris. Whatever type of safari you are looking for, Namibia has it.